ripping back (frogging) to correct an error is a royal pain--the bits of yarn are so precisely calibrated lengthwise that no slack remains for correcting a mistake. Here is a better join, an un-vention* I call a "back join." The back join gives you greater control over the exact place where the join will occur, you can easily pull it out and do it over if the join is not quite in the correct spot, and it allows you to leave extra yarn hanging on the back until the end of the project--so ripping to correct is easier. Further, unlike the Russian join, the back join can be modified to work in the tails over several rows--the extra bulk from the worked-in tails need not be confined in the several stitches on either side of the color change. 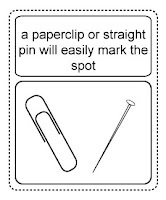 DUE TO FEEDBACK INDICATING THIS POST WAS CONFUSING, A SIMPLIFIED VERSION WITH ADDITIONAL ILLUSTRATIONS WAS POSTED ON JULY 1, 2007 (CLICK HERE). THE INFORMATION IN THE BELOW POST REMAINS CORRECT, BUT IT MIGHT BE EASIER TO READ THE SIMPLIFIED VERSION FIRST. 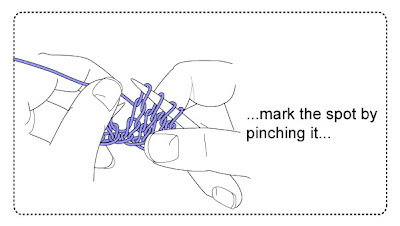 When you've got these three lavender stitches knitted with the doubled strand, snip off the yarn going back to the ball. Again, leave a plenty gracious lavender tail hanging on the back of the fabric, just in case you'll need to rip out in the future. The next step is to knit the next three stitches in purple yarn, again using a doubled strand of folded yarn--purple yarn this time. 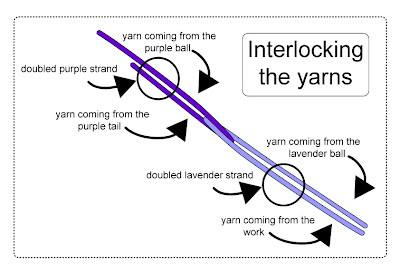 Again, the doubled strand of purple is composed of the tail yarn held alongside the standing yarn. The result: The lavender yarn and the purple yarn are interlocked on the back of the fabric, and the tails of both are worked in. If the color change of the join somehow hasn't come out in quite the right place, only six stitches stand in the way of correcting that--rip the six double stranded stitches back and start again. Also, if you find a future need to rip out more of your work, there is excess yarn hanging on the back of the fabric, just waiting for you to use it for correcting a mistake. When the project is finished, wash and block it, then gleefully snip off all the excess ends about 1/2 or 1/4 inch from the fabric back--they've already been worked in! In wool, after few more washings, any tails that haven't disappeared by being matted onto the fabric surface, can be clipped level with the face of the fabric. In slippery fibers--acrylic, cotton, linen, bamboo, and the like--you're probably better off leaving a short tail on the inside for all time. 1) REDUCED BULK BACK JOIN If you do not care for the bulk of six doubled stitches in a row (3 lavender, 3 purple) try this. Work the lavender stitches in as usual. However, instead of working the tail of the purple yarn into the first three purple stitches after the color change, leave the purple tail dangling on the back of the work and knit a whole round. When you have come to the joined color change-spot on the next round, the purple yarn will still be dangling back there. Now pick it up, hold it together with the standing yarn, and knit it into the first three purple stitches in this SECOND round. These three doubled purple stitches will be separated from the first three doubled lavender stitches by one row--making the lump in the fabric less concentrated. This reduced bulk join "jogs" where the color changes. 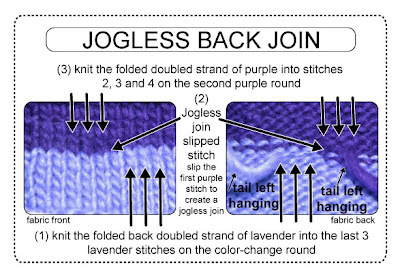 In a circular knit garment where the "jog" would be a problem, you can make this reduced bulk join "jogless"
(1) Knit the last three lavender stitches with a folded back doubled strand. Switch to purple, but knit ONLY with the standing yarn--leave the tail dangling on the back of the fabric. (2) When you come back to the color-change spot on the second round, SLIP the first purple stitch which you knit in the round below. 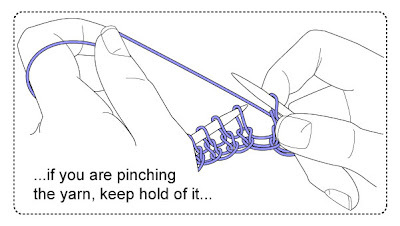 (3) knit the following three purple stitches with the doubled stand (that is: knit the second, third and fourth purple stitch of the second round with the tail yarn--which you will find dangling where you left it on the round below--held together with the standing yarn, to make a double strand). Here is an photo of both fabric faces of a jogless back join, "in the wool." To make a back join on back and forth (flat) knitting, locate and pinch a spot just past the last lavender stitch in the last lavender row. Unravel the last three lavender stitches you knit, interlock the lavender and purple yarns, re-knit the last three lavender stitches with the lavender standing yarn PLUS folded-back standing yarn. Snip the lavender yarn, leaving several inches of tail. On the next row, knit (or purl) the first three purple stitches with a double strand made of the purple tail yarn held alongside the purple standing yarn. 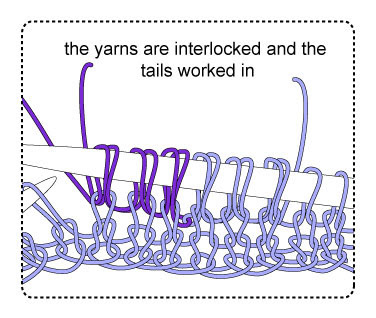 If you don't want two rows of double yarn, one above another, you can modify the join to reduce bulk: leave the tail hanging on the first purple row, then wait until the second pass-through in purple to knit in the purple tail. Last note: After you have located, marked (or pinched), raveled out and re-knit several sets of three stitches, you will know instinctively where to locate the interlock color change point WITHOUT having to knit, mark and ravel out--you'll be able to interlock, fold back and knit without any break in your rhythm. At this point, I believe you will find the back join far faster (and more satisfactory) than the Russian join. *An "unvention," is a knitting trick which doubtlessly has been invented before, but which is revealing itself to the unventor anew.